Exhibition view from "Uncanny Valleys: Andy Fedak + Angela Washko" at Marymount California University's Arcade Gallery. Curated by Misha Rabinovich. Heroines With Baggage is an ongoing project devoted to the study of the proliferation of subtle (though upon further investigation - not subtle at all) gender-based stereotypes found in narrative storytelling throughout the video games that I grew up playing and how the presence of these stereotypes impacted my growth- especially in my expectations regarding love, tragedy, and the roles I take on in my adult relationships. 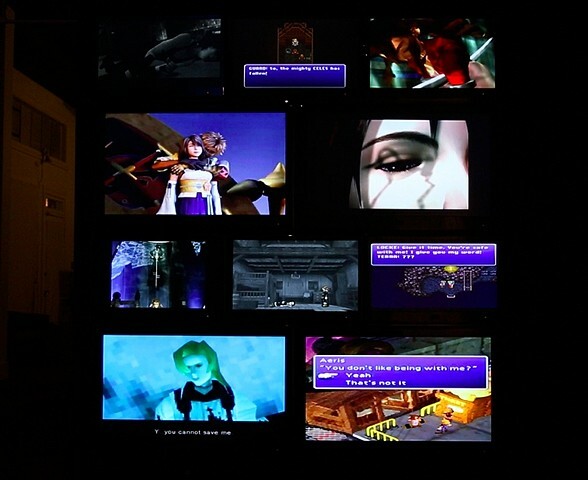 The images and videos from the series have been captured from my experience re-playing and deconstructing a number of RPGs including Final Fantasy 2-10, Chrono Trigger, Valkyrie Profile, Metal Gear Solid, Metal Gear Solid 2, Star Ocean, Thousand Arms, and more.